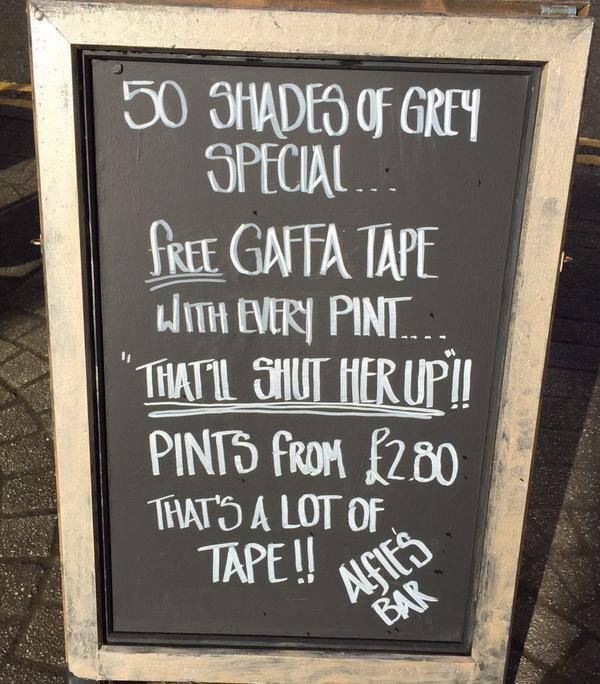 SCOTTISH PUB ALFIE’S Bar are in hot water after a sandwich board offering free gaffa tape to ‘shut her up’ has been condemned by campaigners claiming it trivialises domestic abuse. The bar–who describe themselves as the Best West End Student Bar–have since removed the tweet, but it didn’t stop outrage over what many labelled sexist, misogynistic, and trivialising domestic violence. “@AlfiesBar: We couldn't resist!!! 😂😂 http://t.co/dymo8EEPZs” nice to know misogyny is alive and well in Glasgow. @AlfiesBar Please take down the 50 shades sign outside the bar. Violence against women isn't funny. @AlfiesBar Given levels of sexual harrassment experienced by female students why on earth did u think this was a fun idea? @AlfiesBar think some folk need to get a sense of humour. We here at Alfie’s Bar do not under any circumstance condone any violent act, regardless of age, gender or ethnicity etc. We did not under any circumstance mean nor intend to offend anyone, however this has transpired clearly not to be the case.The 50 Shades of Grey post was intended merely as a childish joke regarding the launch of the movie and book series. They explain that they believed groups such as Women for Independence were using the image to rile up a hate mob by taking the remarks out of context. We sincerely apologies to those of you whom have been offended by this image, however we would like to state we have a number of female patrons that share the view, that this image is a joke, all be it in bad taste.